Basket weaving is a really fun addition to your Fiber Arts curriculum! This page is for you- teaching ideas, links to specials, and most important of all: the National Standards Information that you need for your lesson plans. 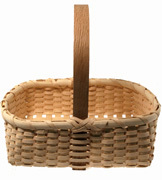 School Purchase Orders are welcomed at BasketWeaving.com. Fax School PO's to 561-828-5968 and your order will be shipped immediately. Or, use your charge card for an online order. 4th graders on up really flip for this basket! I'll usually woven it in two class sessions, 45 minutes each. During that amount of time, even with everyone working at their own speed, everyone will finish the basket. Tell them about Basket History. Show them different kinds of baskets. 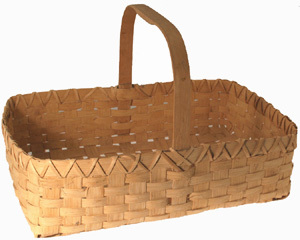 Be sure to review the sample topics integrating basket weaving with CORE curriculum. 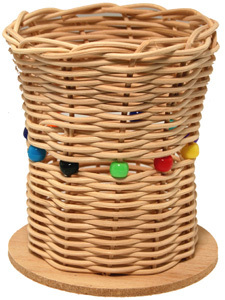 If you want to try some basket weaving with pre-school or Kindergarten, try the styro cup method. In addition to curriculum studies, this project is also a great gift project for Mother's Day, Father's Day, etc. 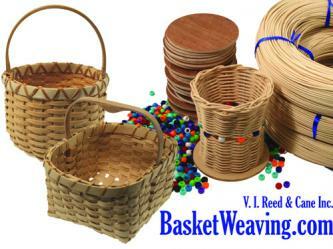 If your students have never woven a basket, start off with a Kids Kit, as shown for the Elementary students. They'll be impressed and get a lot of satisfaction out of it. you can try any of the above baskets. Plan on a one week unit. For their first project, everyone should weave the same basket technique. That doesn't mean the baskets will all be alike; they'll be as unique as their weavers. Also insist that they prepare all of their supplies ahead of the weaving: that is, cutting the spokes. Since it's "all about me" in Middle School, you might have the students embellish the baskets as self-portrait baskets- decorated with color and texture to signify what they're all about. Yarn, raffia, pictures, beads, etc. Challenge: How can my basket reflect my personality? For High School, we suggest a two or three week unit. Order an assortment of 1/2" flat, 1/4" flat, some dyes, some #4 round reed, handles etc. 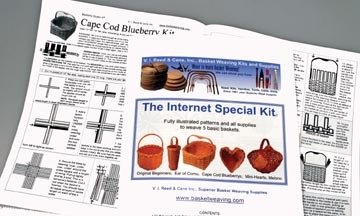 Look over the Kits page to see what kinds you like and what kind of materials they use. We'll be happy to give you some free patterns with your Purchase Order- just tell us which ones. Or, take a look at our Books. Do a one class demo of basic structures and then let 'em loose with the patterns and supplies. Or, how about a Basket Challenge? Teachers Choice: based on a theme, or a material (baskets made of recycled materials?? ), you name it! 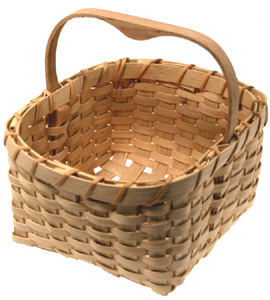 Since students with impaired mental function do not necessarily possess delayed parallel fine motor development, basket weaving is an opportunity for a project with a high success level, especially if taught 1 on 1. And for those who do have difficulty with fine motor coordination, basket weaving is an excellent link between the thinking process and manipulation process. Our suggestion: take it slow and step by step. Put in the base spokes the first time. Weave the bottom of the base and then put it aside for another session. Weave one weaver and put it aside. The greatest successes will come with patience and taking time to enjoy the tactile event that's taking place, the rhythm of the weaving and the quiet of the concentration. 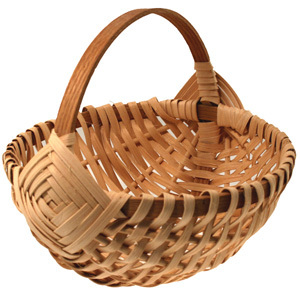 Senior Citizen basket weaving students usually find that basket weaving has shown a positive effect on their ability to maintain manual dexterity, and also as a means of warding off the stiffness of arthritis. Persons with even major sight impairment can weave baskets. Mentally, basket weaving can also help to keep senses sharp in the same way that puzzle-making, crossword puzzles and balancing the checkbook without a calculator all require more active brain manipulation than the passive use of calculators. With basket weaving, measurements are taken as supplies are cut; decisions are made as the weaving progresses, and most of all, a deep sense of satisfaction comes with the finished basketry! I also think that the relatively short amount of time that's required to weave a basket is a good incentive for introducing this craft. Good, clean, fun! Most American school systems now require alignment with the National Visual Arts Standards. Follow the links above to a complete list of each grade span with the numbers and letters for your lesson plans. 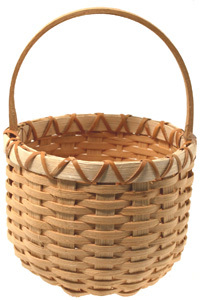 Basket Weaving can be relate to most all of the Content Standards. We suggest: write or print the entire list for your teaching level in the lesson plan book. Then use the appropriate number and letter in the lesson plan blocks to cross reference the Content and Achievement Standard. 1. Content Standard: Understanding and applying media, techniques and processes. ALL GRADE LEVELS will benefit from the correlation of basket weaving to cultural, social studies, math, science and history in the CORE curriculum. elementary debate: Is basketry Art or Function? a creative writing project with a basket theme, etc. language arts- alliteration, synonyms, adjectives, etc. The list is practically endless since basketry and fiber arts are prominent in all history and cultures. 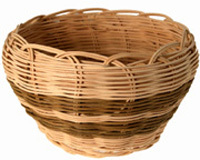 You could easily have a BASKET DAY in your classroom, with everything you do related to the humble art of Basketry.